Reminders — they are in our smart phones, computers, ovens, microwaves, washers, dryers, and various other devices and appliances. Why so many reminders? We live in the era of multitaskers, filling every moment of our lives with activities. “Israel” is not only a land blessed by God, Israel is a people blessed by God — a people through whom He blesses the rest of the world. From the beginning, God put His geographical stamp on Israel. In Leviticus 25:23, He said, “the land is Mine.” And in Genesis 12:3, He pronounced the consequences of supporting or not supporting His people. “I will bless those that bless you, and I will curse him who curses you; and in you all the families of the earth shall be blessed.” What Believer wouldn’t want to secure these blessings that God promised through His people? God promised Abraham and Sarah that He would bless the world through their descendants (check the lineage laid out in Matthew). He gave the instructive Law through Moses. In time, He revealed the New Covenant, which we find in Jeremiah. The Mosaic Covenant and the New Covenant have significant differences. The Mosaic Covenant demanded obedience. It was conditional — “I will, if you will.” The New Covenant has no such condition. It freely offers forgiveness of sin regardless of the person’s rebellious condition. The Mosaic Covenant was written on stone tablets not once, but twice, because of Israel’s rebellious heart. The New Covenant is carved on the hearts of God’s people, as noted in the Jeremiah passage above. Every Believer during this the Church Age — that is, the period after Yeshua’s resurrection when Jewish and gentile followers of Yeshua worship as the assembly of Believers — receives the full benefits of the New Covenant. Not to be left out, Israel will see a day when the benefits of the New Covenant extend to include that nation. The Jewish nation of the Millennial Age will turn to the Redeemer (Yeshua), and their doing so will bring the culmination of God’s elective purpose for Israel. This brings us to the Church, which was birthed at Pentecost. Almost everyone who was saved and added to the assembly of Believers at Pentecost was Jewish. Evangelizing Israel during the days leading up to and following Pentecost — and later, taking the Gospel to the remainder of the known world — was accomplished by Jewish believers in Yeshua (the first missionaries). I suggest that the next time you meet a Jewish person, thank him or her for the Gospel of Yeshua and enjoy their reaction! You might be surprised at your opportunity to be a witness. Printed circuit board — Invented by an Austrian Jew, Paul Eisler. USB flash drive — Invented in Israel. Cellphones — Invented by an American Jew, Martin Cooper. From the polio vaccine to the heart defibrillator (invented/developed by American Jews) and pacemaker (Jews and gentiles contributed), numerous medicines and medical devices have been invented/developed by Jews from the U.S., Israel, and other nations. Irving Berlin, Hyman Rickover, Lerner and Loewe, Harrison Ford, George and Ira Gershwin, Edwin Land, Daniel Radcliffe, etc., etc. Please show your support for Israel by partnering with Zola Levitt Ministries as we continue Zola’s unapologetic vision of revealing to the world the real Israel as “the apple of God’s eye.” We could, in fact, be the last generation to reach our Jewish friends with the Gospel. (See Luke 21: 31–32) That statement is not hyperbole — it’s a warning that time is running out. The King is coming, and soon! P.S. What reminder went off as you read this note? Did you think about a people who have struggled to survive the most difficult circumstances? Did you think about our LORD’s sacrifice that settled forever the issue of the Law’s requirements? Or, did you call out “Thanks” to God for the Bible in your hand? I pray that your soul has been stirred, and you will give God the glory for the wonderful things He has done through His chosen people! Tony’s insightful message of why gentile Believers should stand in support of Israel and the Chosen People reminds us that, even today, we reap the benefits of a covenant blessing. God’s hand will always be upon His chosen people. In 2017, we see that covenant in action. So, how can we Believers support Israel when most of us live a great distance away? By supporting this ministry, you support Israel! ZLM upholds many ministries in the Holy Land while bringing you news from Israel and illuminating Yeshua’s Message every week. Zola’s vision lives on. We thank all of you who contribute automatically through our Monthly Gift Program to ensure that the message of “Christianity through Jewish eyes” continues. Your investment is paying off in the form of unique teaching by Jewish Believers who live day to day in Israel. They see firsthand the loving and practical relationships formed as Believers — Jew and gentile — work together to gather God’s own to Him. 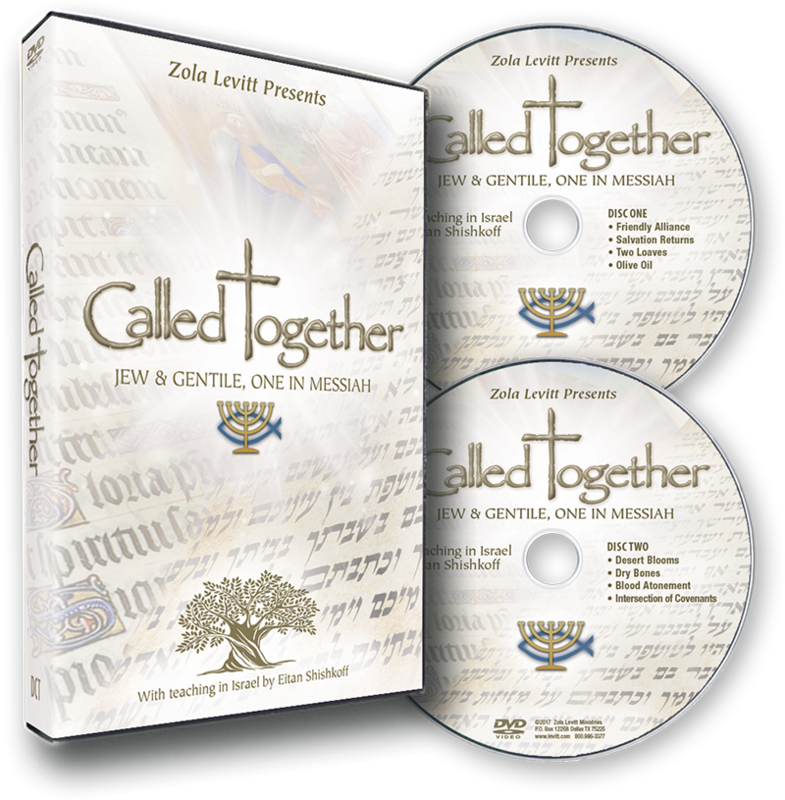 In September, Zola Levitt Presents continues airing our newest series, Called Together. Eitan reminds us that Israel was the “messenger light” to the gentiles, who now take the Gospel message back to where it began. Importer of humanitarian aid Jim Schutz explains how gentiles reflect God’s love. An Israeli Jew and Polish Christian call us to support the Jewish people. Chaim and Deanna Malespin show us where they were married, and teach us “Jesus” in Hebrew. Messianic singer Caroline Hyde shares “Oseh Shalom.” Jeff Seif helps us apply series teachings to our lives. Peter learned the mystery of gentile salvation at the house of Cornelius, welcoming gentiles into the family of God. Eitan explains that the wall separating the gentile and Jewish worlds remains a barrier to Israel’s salvation. Vineyard owner Yaakov Berg compares grapes to the Jewish people making aliyah. Chris Chambers’s love for Israel resulted from his Christian faith. Chaim Malespin discovers who has been pruning the grapevines in Samaria, and Diana Frenkel teaches us God’s Hebrew name. David Hart sings Zola’s classic song “Sha’alu Shalom Yerushalayim” from his Jerusalem 3000 album. Eitan sees gentile Christians and the Messianic Jewish community as called together into a shared priesthood. David Parsons, media director at the International Christian Embassy Jerusalem, invites Christians to come and help draw Jewish people back to our promise-keeping God. Activist “Jerusalem Jane” encourages Believers to stand with Israel. Chaim looks forward to the Eastern Gate’s eventual opening, and Diana teaches a Hebrew icebreaker, “What’s Up?” Harvey Schmitt sings Zola’s classic song “Righteous Gentile” from his Champions of Faith album. Another way you can support Israel is by taking your backpack or pocketbook there, literally. Help counter the boycott of Israeli products by going to Israel and physically spending your time and money there. Tourism helps boost the Israeli economy, and your presence reassures the residents of Christian friendship. Your pilgrimage constitutes a tangible way to support the Jewish people, and it will change your life at the same time. We call that a win-win. Zola Tours makes your study tour pilgrimage easy for you. If you’ve never been, sooner is better than later. If you’ve been before, come again! Join us — David and Kirsten — and Tony and Jane this fall or next spring. For questions and itinerary details, please contact Zola Tours manager, Sandra, at 214-696-9760, email her at travel@levitt.com, or visit levitt.com/tours. See above for tour options, dates, and pricing. May I never forget the Jewish people’s contributions. Your reminder encourages me to make Zola Levitt Ministries a high priority in my prayer life. The covenants made by God with men and nations throughout the Bible are guideposts for understanding scripture. Composed by Zola and played by him on his Lorée oboe, this album’s music reflects the beauty Zola has seen, the sadness he has felt, and the pure inspiration God has given him. Messianic Roots Label Pin or Tie Tac. An ancient Messianic symbol — believed to be used as a seal by the first Christians, who were Jewish — combines the menorah, Star of David, and the Christian fish.